This discussion assumes the aircraft is being flown in coordinated flight, which means the longitudinal axis of the aircraft is aligned with the relative wind. On the PFD, the attitude indicator shows if the wings are level. 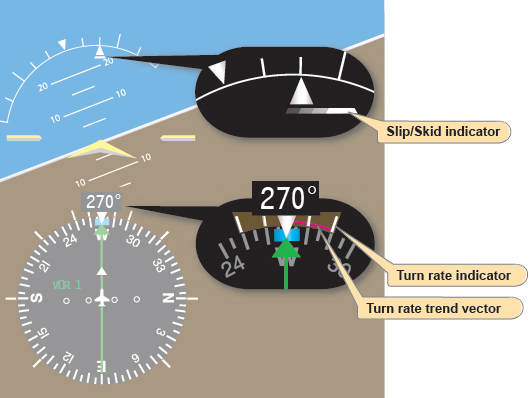 The turn rate indicator, slip/skid indicator, and the heading indicator also indicate whether or not the aircraft is maintaining a straight (zero bank) flightpath. The attitude indicator is the only instrument on the PFD that has the capability of displaying the precise bank angle of the aircraft. This is made possible by the display of the roll scale depicted as part of the attitude indicator. Figure 7-52 identifies the components that make up the attitude indicator display. Note that the top of the display is blue, representing sky, the bottom is brown, depicting dirt, and the white line separating them is the horizon. The lines parallel to the horizon line are the pitch scale, which is marked in 5 degree increments and labeled every 10 degrees. The pitch scale always remains parallel to the horizon. The curved line in the blue area is the roll scale. The triangle on the top of the scale is the zero index. The hash marks on the scale represent the degree of bank. [Figure 7-53] The roll scale always remains in the same position relative to the horizon line. Figure 7-53. Attitude indicator showing a 15° left bank. The roll pointer indicates the direction and degree of bank. [Figure 7-53] The roll pointer is aligned with the aircraft symbol. The roll pointer indicates the angle of the lateral axis of the aircraft compared to the natural horizon. The slip/skid indicator will show if the longitudinal axis of the aircraft is aligned with the relative wind, which is coordinated flight. With the roll index and the slip/skid indicator aligned, any deflection, either right or left of the roll index causes the aircraft to turn in that direction. With the small graduations on the roll scale, it is easy to determine the bank angle within approximately 1 degree. 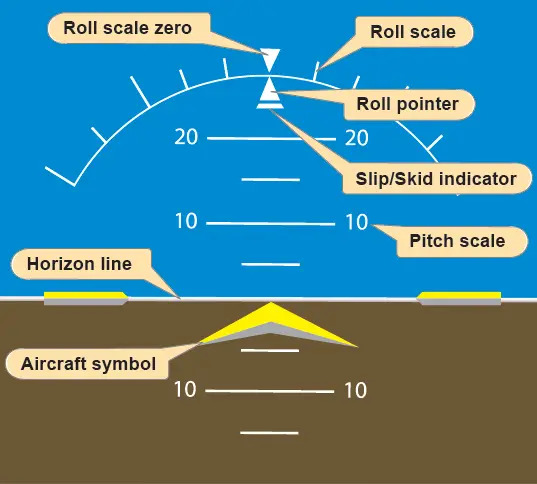 In coordinated flight, if the roll index is aligned with the roll pointer, the aircraft is achieving straight flight. An advantage of EFDs is the elimination of the precession error. Precession error in analog gauges is caused by forces being applied to a spinning gyro. With the new solid state instruments, precession error has been eliminated. Since the attitude indicator is capable of showing precise pitch and bank angles, the only time that the attitude indicator is a primary instrument is when attempting to fly at a specific bank angle or pitch angle. Other times, the attitude instrument can be thought of as a control instrument. The horizontal situation indicator (HSI) is a rotating 360° compass card that indicates magnetic heading. The HSI is the only instrument that is capable of showing exact headings. The magnetic compass can be used as a backup instrument in case of an HSI failure; however, due to erratic, unstable movements, it is more likely to be used a supporting instrument. In order for the pilot to achieve the desired rate of change, it is important for him or her to understand the relationship between the rate at which the HSI changes heading displays and the amount of bank angle required to meet that rate of change. A very small rate of heading change means the bank angle is small, and it takes more time to deviate from the desired straight flightpath. A larger rate of heading change means a greater bank angle happens at a faster rate. The heading indicator is the large black box with a white number that indicates the magnetic heading of the aircraft. 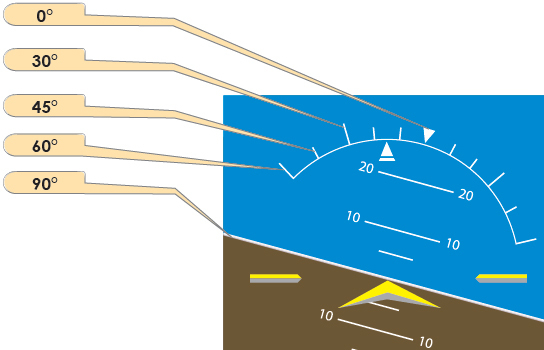 [Figure 7-54] The aircraft heading is displayed to the nearest degree. When this number begins to change, the pilot should be aware that straight flight is no longer being achieved. Figure 7-54. Slip/skid and turn rate indicator. The turn rate indicator gives an indirect indication of bank. It is a magenta trend indicator capable of displaying halfstandard as well as standard rate turns to both the left and right. [Figure 7-54] The turn indicator is capable of indicating turns up to 4 degrees per second by extending the magenta line outward from the standard rate mark. If the rate of turn has exceeded 4 degrees per second, the magenta line can not precisely indicate where the heading will be in the next 6 seconds; the magenta line freezes and an arrowhead will be displayed. This alerts the pilot to the fact that the normal range of operation has been exceeded. The pilot must always remember to cross-check the roll index to the roll pointer when attempting to maintain straight flight. Any time the heading remains constant and the roll pointer and the roll index are not aligned, the aircraft is in uncoordinated flight. To make a correction, the pilot should apply rudder pressure to bring the aircraft back to coordinated flight.